On most days, I would not consider my style anywhere along the descriptive terms: chic, country, or rustic. But this week I make an exception for that. 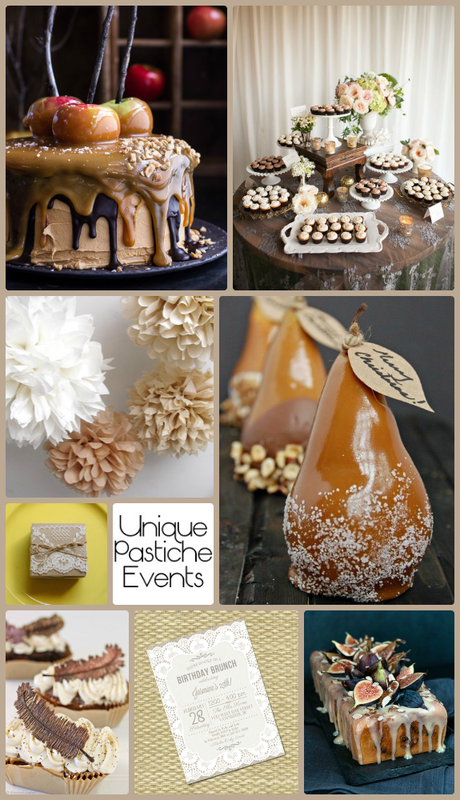 This week I am sharing with you my idea of a rustic, foodie’s dessert party. A party that is farm-to-table fresh, cooked and prepared with love, and boasts great company and delicious wine. I love the emphasis of salted caramel desserts lining a lace and burlap table, allowing guests to graze on delicious treats as they mingle with other attendees. The only thing that’s missing would be a handful of accent candle lights, in mason jars, of course, scattered around. Keep in mind as you are enjoying this party idea board, that this set of inspirational images could easily translate to a birthday party theme, or even a wedding. Are you a caramel fan? Or do you prefer something more along the lines of chocolate to satisfy your sweet-tooth?